Taco Bell knows how to play to the hits, and that's a real strength. Sure, occasionally it throws Kit-Kats into a quesadilla, but that's still a quesadilla. And yes, unveiling a half-pound meat boat was pretty extreme, but it was still just meat and cheese. Here's the latest example of that commendable mindset: the $1 Loaded Nacho Taco. As you probably deduced from the name, it's a taco that's stuffed with nachos and costs a single dollar. As for what's in it, it's a flour tortilla filled with nacho cheese, lettuce, cheddar cheese, and mini Southwest Seasoned Chips. 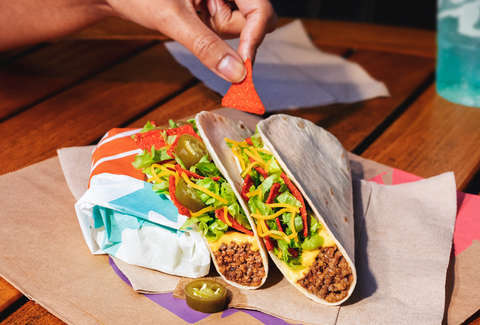 We know those chips have lime, tomato, and garlic seasoning, but it's unclear whether they'll stab you in the mouth every single time you take a bite. There's also a spicy version of the taco that comes with jalapeños, and either version can be added to a $5 box. That'll get you the Loaded Nacho Taco, plus a Beefy 5-Layer Burrito, a crunchy taco, Cinnamon Twists, and a medium drink. We hope this makes up for the fact that Nacho Fries are leaving the menu yet again.